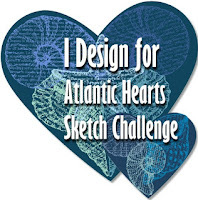 I found a fun sketch to create with at Atlantic Hearts Sketch Challenge. With the Buy 3 Get 1 Free promotion on select designer series papers at Stampin' Up this month, this one was perfect!! !